My research and publications are in the field of working life, management, industrial relations, sociology of organizations and economic sociology. I am focusing upon work and organization and the roles of new forms of management and ICT technology under more competitive and globalized market conditions. 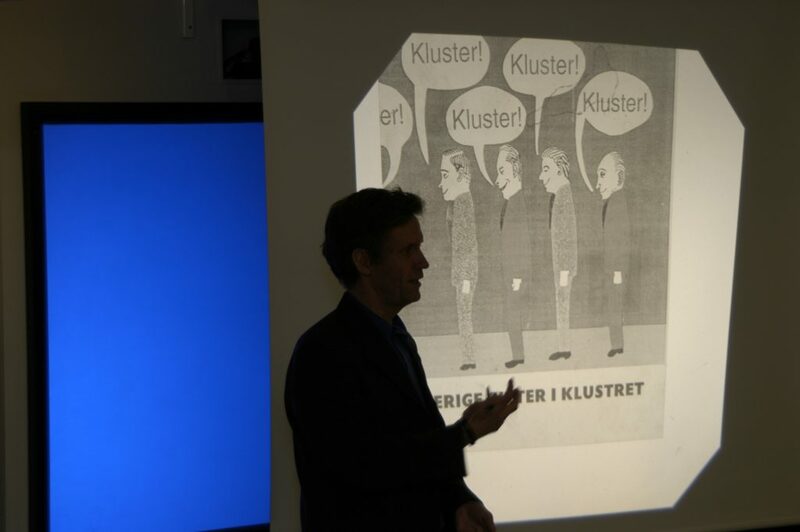 The picture is from a presentation on a study at Kista Science City, in the northern part of Stockholm. Key aspects are the possibilities of reaching welfare and ’good work’ at the same time as competitiveness and efficiency, using modern technology and management. An interesting dimension is the relation between the quality of work (health, qualifications, control) and the resulting quality of products and service – and also with the latter, in many jobs, being part of the former. Early studies covered planning and futures studies, Industrial Relations, the methodology of change oriented research in interaction with more traditional empirical/ theoretical research (interactive research). Later: studies of socio-technical forms of work organization in e.g. the car industry as alternatives to lean production; new forms of management and ’flexible firms’; computers at work; processes of designing IT and work organization, and the the MITIOR programme: ’Media, IT and innovation in organization and work’ at Arbetslivsinstitutet/ NIWL and at KTH Royal Institute of Technology. This research continued at Stockholm University and its Department of Sociology. Aspects and perspectives thus, in summary, include work, organization, labour processes, labour markets, qualifications; new management ideas and reality; new ICT technology at work; flexible and deregulated work; CSR Corporate Social Responsibility; networks among companies and individuals; clusters, geographical aspects; competence, health, physical work environment, stress. Methodologically and as to research approach, pluralism is advocated, with both qualitative and quantitative studies. A specific interest is understanding the relation between theoretical-empirical research, and research more closely interacting with the field, with organizations and movements, and with processes of social change – which seems related to what some today call ’public sociology’; we have discussed the pros and cons of ’interactive research’ with phases or subprojects focusing on professional, academic distance on the one hand, and closeness to actors (organizations, movements) on the other hand.